Twin Arch is a high quality yet affordable choice for distinctive bath, bar, kitchen and commercial countertops. Once you choose from the array of sought after colors and textures Twin Arch is then digitally measured, cut, polished and installed for your specific project. Twin Arch countertops can be kept clean with the use of a soft damp cloth and a non-abrasive cleaner. 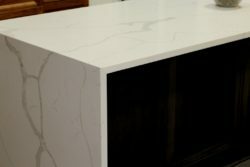 Although the durable quartz surface is highly resistant to most stains, including red wine, it is best to quickly wipe up a spill and thoroughly clean the area. For tougher stains and dried on substances, scrub the area with a non-abrasive sponge or cleaning pad using a mild, non-abrasive cleanser (Soft Scrub Gel) to avoid scratching the surface or damaging the finish.